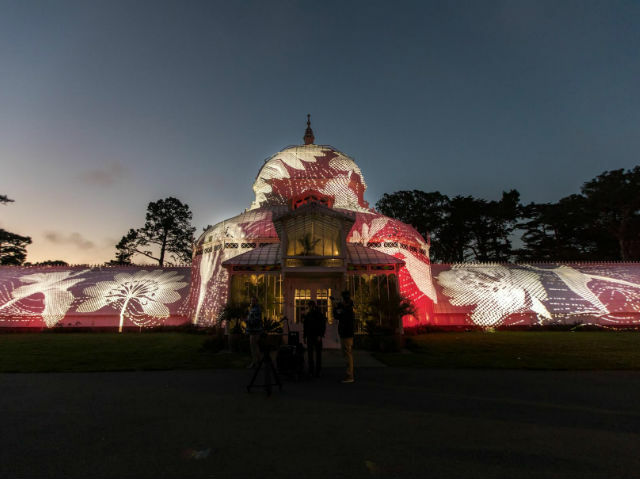 The wildly anticipated trippy Summer of Love light show at the Conservatory of Flowers in Golden Gate Park has its grand lighting ceremony Wednesday night, but the technical and artistic aces of Illuminate and Obscura Digital did a series of test projections Monday night in preparation for these evening displays of color scheduled to run every night through October. 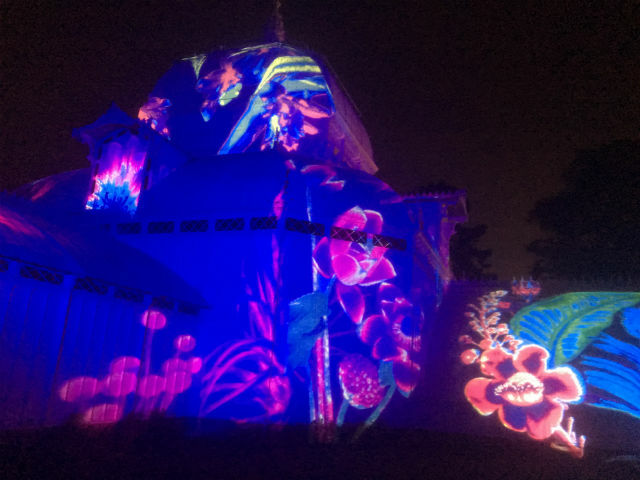 SFist was there to capture pics and video of the illuminated magic to come, getting a sneak preview of how the project uses the exteriors of the 1879 Victorian greenhouse as a canvas for 1960s-inspired psychedelia. 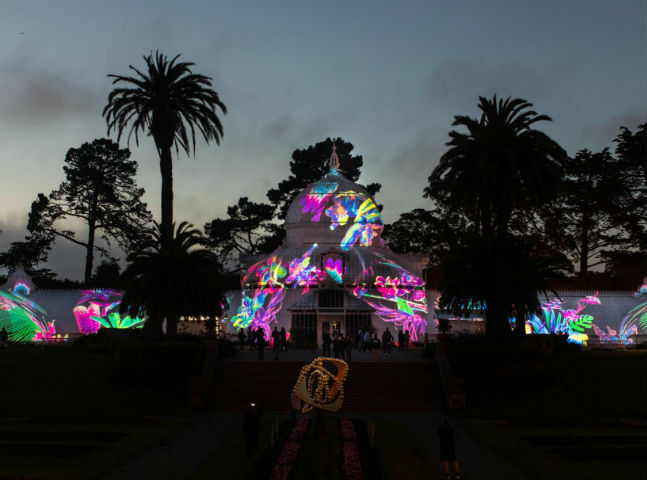 In all, ten different projectors will implement six different themes (some of them animated) to create a dazzling, high-tech yet retro feast for the eyes to honor the 50th anniversary of the Summer of Love. Wednesday’s ceremony coincides (arguably) with the Summer Solstice and the first day of summer, and Rec and Parks tells us the countdown and and official lighting will occur at “dark o’clock” Wednesday night. (That’s currently projected to be 9:18 p.m.) The festivities kick off at 6 p.m. with a free Surrealistic Summer Solstice Concert, for which you’re encouraged to come early, bring blankets, and RSVP. The projections are run from the two modest little kiosks seen above. Logistics on the project started back in March, with a team of technical lighting specialists, software engineers, and infrastructure experts. “We 3D mapped the building,” said Obscura Digital’s Ann Brilz, the executive producer on this project. 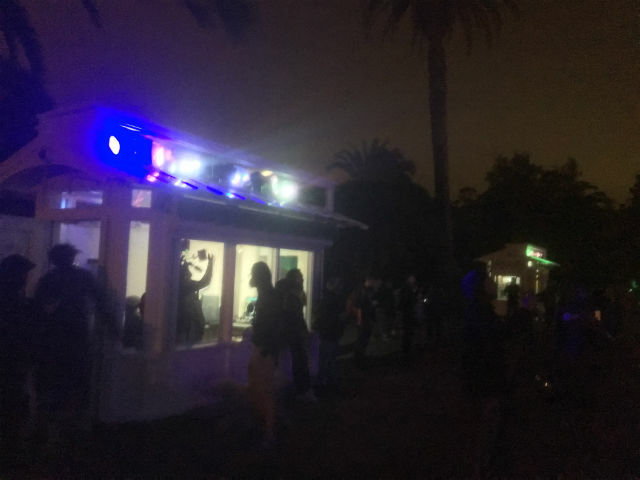 “We scanned it and created a model and learned how to map our images to the architecture.” Actual construction and testing have been underway for the last six weeks, generally between the hours of 9 p.m. and 2 a.m.
“We were limited to the darkness,” Brilz told SFist. But once Wednesday’s Grand Lighting takes place, the projections should essentially work on auto-pilot. The video above should not be considered a “finished product” display of the lights’ animated capabilities. Monday night was just a dry-run test, and not all of the hardware pieces have even arrived yet. Further, this is just one small section of a very large animated illuminated canvas. Here we see lighting technicians making last-minute alterations to the display. You'll notice how they have to map individual bits to fit together into a larger piece, and if you listen closely you can hear the lighting techs trying to coordinate the razzle-dazzle. Obscura Digital was also behind the City Hall 100th anniversary display, and they’ve done projections at the Vatican and New York’s Empire State Building. 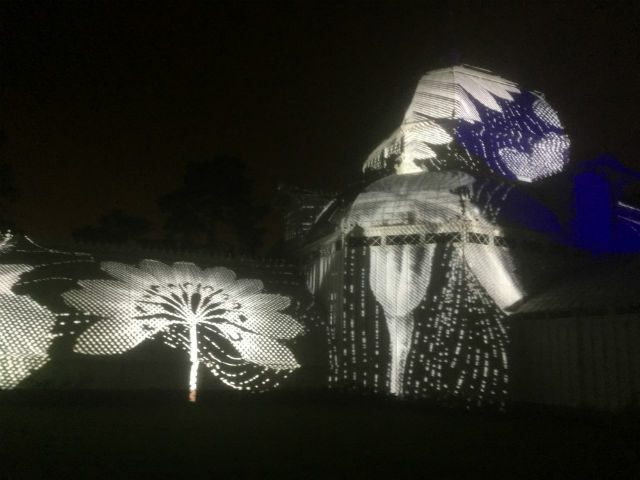 While this display is currently scheduled to run until the end of October, the Obscura people have big plans for more projections. 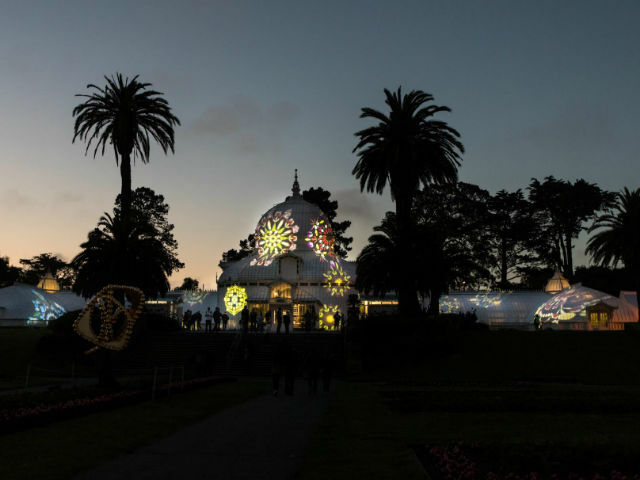 You can celebrate the lighting of the Conservatory of Flowers from 6-10 p.m. Wednesday at the Surrealistic Summer Solstice Concert from 6-10 p.m. (RSVP here), and nightly at sundown through October.